Making dairy products is not an activity often carried out in today’s homes, but the dairy was once commonplace in even fairly small households.? In some districts a milk cow formed part of a labourer’s wages, on loan until it ran dry.? A goat was often also kept, in part to cover the cow’s dry period, and so part of the housewife’s duties would be to turn some of the milk into cream, butter and even simple cheeses. Pasteurisation has interfered with many of the natural processes, killing as it does both good and bad bacteria, so that now the required cultures have to be deliberately reintroduced to make sour cream, yoghurt and buttermilk.? But for those with access to raw milk it is useful to learn the traditional dairy skills, in part so that the knowledge does not die out, but also so that none of the precious milk is wasted. Dairies were separate from the main kitchen for a couple of reasons, mainly cleanliness and temperature.? Both are still important, although refrigerators are now available for cold store, but the need for absolute cleanliness is still paramount.? All equipment should be sterilised with boiling water before use. I prefer milk from glass bottles to that from plastic or cardboard cartons, but, unless there is a system for re-using the bottles, glass is not always economically viable.? You can decant the milk, Hook and Son sell the traditional glass bottles to do this, or you can use a milk jug but it should be kept covered to prevent bacteria entering.? Whatever vessel it is stored in, the milk should be returned to the fridge as soon as you have finished using it, and not poured back into the bottle.? The lactobactilli will slowly make lactic acid in the fridge, but the milk should still be perfectly pleasant to drink at the end of a week. The beauty of this jug (the smaller one being preferable for milk) is that you can pour from either end, one pours from a spout rising from the base, and the other end will pour from the top.? The only disadvantage is that the surface area is larger than I would ideally choose, and cling film seems to be the only cover that will fit. ?At the end of a week don’t throw away any leftover milk.? You should notice that, unlike pasteurised milk, the smell is pleasantly tangy rather than “off”. ? ?Cream will have become Crème Fraiche. ?If you remove the milk from the fridge and stand it a room temperature the lactobacilli will multiply more rapidly, eventually causing the milk to curdle. ?Scientifically what is happening is that the casein micelles are becoming destabilised, causing them to form a network that partially immobilises the water and traps the fat globules in a newly formed matrix, meanwhile the whey proteins remain in suspension.? This naturally soured milk (sometimes called Clabbered) has been appreciated in many northern European cultures for centuries, only to disappear with pasteurisation.? Cooks took advantage of the acidity in baking – when mixed with an alkaline substance, usually baking soda, it creates carbon dioxide lightening the mixture.? Most housewives kept sour milk for this purpose – in Britain Scones were the classic use and for me I think it an essential ingredient – try the recipe below and see for yourself. ?In Ireland the bread itself relied upon this reaction for leavening. ? ?The terms Sour Milk and Buttermilk are often used interchangeably, although buttermilk was the residue left from buttermaking (see below) and thus of a slightly different composition chemically.? However both are high enough in acidity to use them interchangeably in baking. If you have a larger quantity of sour milk (say a litre or more) you might want to make a simple fresh curd cheese. There is often confusion about the difference between “curd cheese” and “cream cheese” or even “cottage cheese”.? Although there are differences, mostly in terms of fat content of the milk or cream originally used and the final texture, they are all essentially made in a similar manner – by draining the curds to produce a fresh cheese for eating within a matter of days. A litre of milk will make about 225g/8oz of cheese.? ??? ?As already mentioned the naturally occurring lactobacilli will eventually cause curdling but there are different ways in which this destabilisation can be achieved.? In most cheesemaking, and certainly where the milk has been pasteurised, enzymes (usually rennet – naturally present in a calf’s stomach) are added.? Lowering the pH value of the milk, i.e. making it more acidic, with acids such as lemon juice or vinegar will also result in casein micelle aggregation but will also reduce the calcium content.? Acid curd is more fragile than rennet curd, but in a cheese that is to be eaten fresh this is not a great problem.? A third method is by heating, which causes the denaturation of whey proteins, which then interact with the caseins.? In rennet coagulation only 76-78% of the protein is recovered, whereas a combination of heat and acid can recover up to 90% of the proteins.? This is how Ricotta is made from the whey that is left over after making Pecorino.? Ricotta literally means “re-cooked”.?? I have watched the process at a very small farm in the Garfagnana and been offered the freshly made ricotta to eat whilst still warm.? It is something of an acquired taste, but when you consider how much ricotta is imported into this country I wonder why British producers of ewe’s milk cheeses don’t utilise the whey. 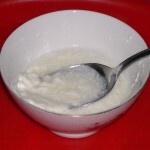 Whether souring naturally or with an additive, the milk should be poured into a sterilised wide bowl (so that the surface area is greater) and then covered with a clean cloth.? Yogurt is the slowest acting additive – use a tablespoonful per pint of milk, and wait until the next day.? Lemon juice or white wine vinegar will react more quickly, you need only a teaspoon to each pint of milk and, depending upon how sour the milk was already, it may separate into curds and whey in only a few hours.? The Indian curd cheese Paneer is always made by souring with lemon juice – it is delicious and since I usually have lemon juice to hand this is the method I normally use. Rennet is commercially prepared for different purposes.? That which is widely sold in supermarkets is less concentrated than that used for cheese (it is intended for Junket).? It will work but slowly.? 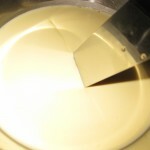 If you want to make cheese with rennet – and this is essential if you want to age it or are using pasteurised milk – you can buy non-GM animal rennet via www.cheesemaking.co.uk.? There are alternatives to animal rennet, some natural plant extracts e.g. from cardoons, others synthetic chemical compounds, but all of them impart a bitter after taste and I would strongly recommend traditional animal rennet. When the curds have separated from the whey you should be able to slice through them with a knife.? Place a colander on top of a bowl, line it with muslin, and spoon the curds into it with a slotted spoon.? Cover and leave to drain overnight.? In the morning gather up the corners of the muslin and tie them to make a bundle which you can then suspend over the colander to drain further – the longer you leave it to drain the firmer it will become.? ?You can then mix it with salt and herbs to eat as a savoury cheese or dip or, if you want it to be sweeter, mix it with a little cream or butter. Whey is the liquid drained away from the curds – it looks like barley water.? Its flavour is mildly sour but the exact nature depends on the method used for forming the curds from which it has drained.? As mentioned above, if the curds were formed by the action of rennet, there will still be in the region of 22-24% protein remaining within the whey.? Most of these solids can be recovered by heating – the method by which Ricotta is made.? Butter was also made from whey, although considered of lesser quality than butter made from sweet milk or cream.? The small quantity of whey available in a domestic kitchen makes it unlikely that either of these options will be viable, but rather than waste the whey, it can be used in place of water in making bread. 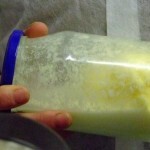 Buttermilk is similar to whey in that it is a low fat liquid by-product, but this time of making butter.? 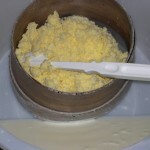 Butter making extracts the fat globules from cream or milk by churning. ?You can try this yourself simply by shaking cream or top of the milk in a jar.? Sometimes it happens accidentally when whipping cream – if you overwhip the fat will separate.? Rather than throwing this away as an expensive mistake, continue whipping until the mixture resembles scrambled eggs.? Drain the buttermilk from the fat solids in a muslin lined sieve, then beat the mixture again for 30 – 60 seconds to expel more butter milk.? Now fill a bowl with ice cold water put the butter in and wash out more buttermilk by kneading the butter on a board with your bare hands or pre-soaked wooden butter bats.? Repeat the process until the water is clear.? Butter making does not actually use a souring agent, but the incorporation of air seems to sour the cream anyway, at least when the cream is unpasteurised, as the buttermilk by-product is indeed slightly, and pleasantly, sour.? It has traditionally been used for baking because the sourness reacts with alkaline ingredients (such as baking soda) to create carbon-dioxide and so aid the rise.? Whey, whilst not as rich, can be used in a similar manner.? Pasteurisation prevents the souring and so commercial buttermilk is now made by adding a culture. Scones should never be made in advance, but eaten before they are cold.? They are very quick to make, but if you want to prepare in advance, you can go as far as rubbing the butter into the dry ingredients, and then add the egg and buttermilk when you are ready to bake them. Pre-heat the oven to 230C/Gas Mark 8. Sift the dry ingredients into a large bowl, then rub in the butter until the mixture resembles fine breadcrumbs.? Add sufficient egg and buttermilk to make a fairly soft dough.? Gently roll or pat the dough out to a thickness of about 2cm/?”.? Cut with a sharp knife of cutter (do not twist the cutter or this will cause uneven rising).? Brush with beaten egg or milk if you like a glazed top.? Bake for 8-10 minutes, until brown and well-risen.? Serve immediately. 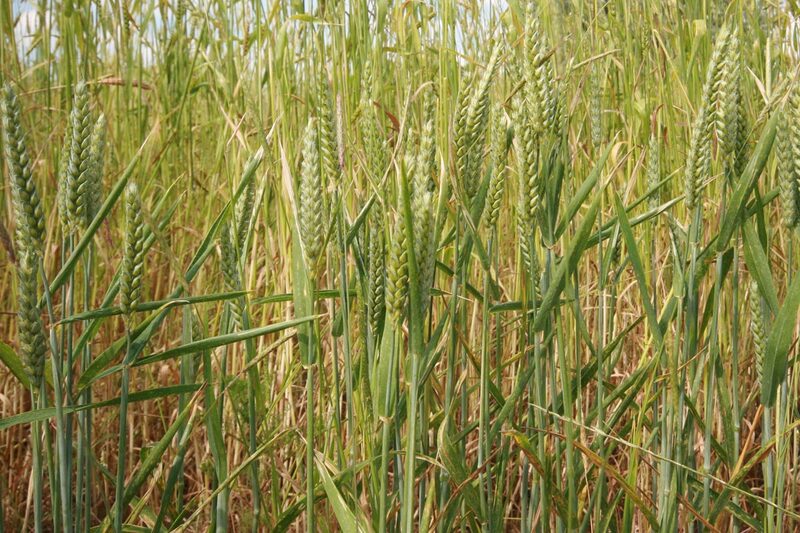 The wheat that grows in Ireland is a very soft wheat which does not make is suitable for the yeast leavened breads eaten throughout the rest of the UK.? Instead they made a “bread” using bicarbonate of soda to lighten it.? The technique is entirely different to yeasted bread, and has far more in common with the making of scones.? The less the dough is handled the better, it is just a matter of combining the ingredients. optional: a handful of fine stone-ground oatmeal can be added.? An egg makes a richer dough. Sift the white flour, salt and bicarbonate of soda into a large mixing bowl.? Add the wholemeal flour and mix well. Make a well in the centre and add most of the buttermilk or sour milk all in one go.? Working from the centre, mix with you hand to bring in all the flour adding the rest of the buttermilk if required.? The dough should be soft but not sticky. Turn out onto a floured board and lightly shape into a round.? Flatten slightly (to about 2″ deep.? Put onto a baking sheet, mark with a deep cross, and bake in a hot oven for 15-20 minutes.? Reduce the heat to 200°C/Gas Mark 6 and cook for a further 20-25 minutes until the bread sounds hollow when tapped. Set some Cream over the Fire, and turn it with Sack and Eggs then drain it well and season it well with Rose-water and Sugar and Eggs, Spice, Currants and a few spoonfuls of Cream and put it into your Crust, adding a little Salt and so bake them. Eventually the Curd Tart became synonymous with Yorkshire – it was always made in a shortcrust pastry case and the filling used curd (rather than full cream) cheese. The revival of interest in cheesecakes in the 20th century owes more to their popularity in America than their historic importance here, although as with much American baking, it may well have introduced by British settlers.? Full fat cream cheese is essential to the famous New York version.? By the time it had travelled back across the Atlantic the base was made of crushed biscuits and it was often, but not always, topped with fruit.? Unbaked versions also became popular.? So once again there are a number of desserts made in the UK that go by the name Cheesecake. The filling for this cheesecake uses flavourings that would have been popular in 17th century Britain, when cheesecakes first became widely made.? For authenticity it would be made with a shortcrust pastry case.? This is where I, not being a great fan of shortcrust pastry, depart from authenticity.? A modern biscuit base is more to my liking, provided it is made with good biscuits.? A biscuit base also has the advantages of being quicker and simpler to make and can, if you wish, be flavoured with spices, such as nutmeg, that also would have been popular in the 17th century.? You can see how all the variations arose! Soak the sultanas in the sherry for at least 2 hours.? At the same time, heat the sour cream with the strands of saffron and leave to infuse. Preheat the oven to 180?C/Gas Mark 4.? Melt the butter then add the biscuit crumbs and nutmeg.? Press into the base of the cake tin and then place in the refrigerator to cool whilst you make the filling. Cream together the cheese, eggs, honey, sugar and sour cream.? Stir in the sultanas, you can include any sherry that has not been absorbed.? Spoon the filling over the biscuit crumb base.? The sultanas will probably all sink to the bottom, but this doesn’t matter. Place a circle of cardboard or thick brown paper over the top of the tin to prevent the filling from browning.? Cook for 50 minutes then turn off the heat and leave in the oven for a further 10 minutes.? At the end of this time the filling should do no more than wobble slightly. Leave to cool in the tin then, when completely cold, cover and refrigerate overnight.? The flavours develop up considerably over time but you should remove the cheesecake from the refrigerator about an hour before serving. This entry was posted in Food Culture, June - Recipes. Bookmark the permalink. Can you advise me where I can buy buttermilk by the pint, rather than the carton, from a farm around Leicestershire. I only know of one in Somerset – Ivy House Farm, but would suggest looking for butter producers at Farmers Markets in your area and asking them.